Knowing full well how deep the brainwashing goes — coupled with cognitive dissonance and inevitable peer pressure, “societal norms,” and everything most of us were raised to think — what follows IS a very uncomfortable and unpopular subject to talk about. Nonetheless, it IS perhaps the most important topic to talk about: America has failed, plain and simple, and there is no way around it. There is a difference between the United States federal government and America, and I can write multiple articles on that subject alone, so for the sake of brevity I will keep it simple. America is an idea, the aspiration of freedom, justice, and prosperity . . . where people govern themselves. Remember, “of, for, and by the people.” That reality has been taken and replaced with a de facto government that has extorted its way to power, and among other actions, pursued wars with other nations, sometimes ADMITTEDLY for the sole purpose of keeping them from becoming prosperous on their own. This de facto government is also waging war upon its own citizens for the very same reasons: to keep us down. Most people see it, and while they might not grasp what’s at stake, they know the game is rigged and feel that they can’t do anything to change it. This is why I chose to write this article now. America has failed; this is true, but it’s not over yet. The oligarchs are trying to wrap up their plans as quickly as they can while they can, BUT, as of right now, there is still a chance of missing the iceberg. Missing this small window of opportunity might be game, set, and match. So, you might be wondering, what has gotten us to this point? You all know there are bad laws, immoral laws, unjust laws in an immoral, unjust, corrupt punishment system, aka the “judicial system.” Why did this happen? That answer is easy: the corporate-owned government needs money to continue its protection racket to keep their power and to keep their pockets lined. That’s the cycle that keeps this corrupt system going. We know now as fact that voting on a national scale DOES NOT MATTER. If you just look for a second at the “choices” you’ve been given over the years and now look at a possible Bush vs. Clinton matchup for 2016 and still think your vote matters, then I don’t think there’s anything I can do for you to convince you otherwise. So what’s the most important factor in this equation? It would have to be law enforcement. As the elite set us up against each other like they always do — the same old divide-and-conquer that they’ve perfected through the ages — it seems they have us right where they want us because we ARE divided six ways to Sunday. Time could not be more precious as we begin our trek through 2015, as you, dear reader, must know by now that World War III has begun and the cold Civil War in America has gone hot. Surely you realize I’m not being melodramatic. 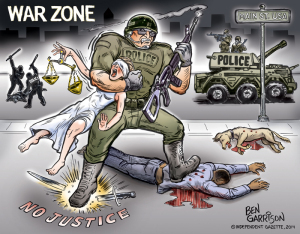 There are conflicts where one side murders the other and says, “They took one of ours, so I’ll take two of theirs,” with the other side saying “Brothers before others” in a society where you are eight times more likely to die by a cop than a “terrorist.” Realize that this is already happening. Americans are killing government agents and government agents are killing Americans. It seems at this point the only thing that can stop what’s happening and what’s coming is if law enforcement across the board decided to stop acting immorally by protecting and serving the ruling class. 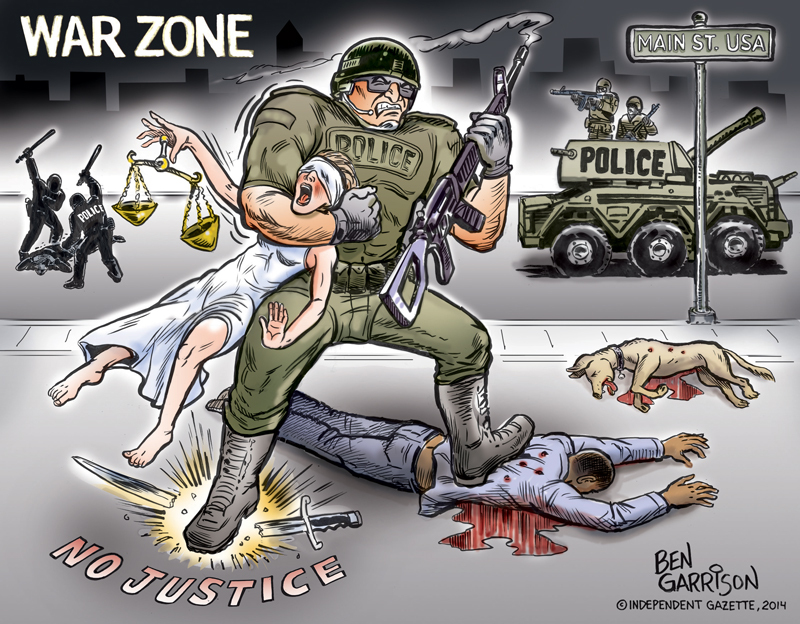 That version of “protecting and serving” is what is making this all possible, and it can be stopped in an instant if cops decided to do the right thing and side with freedom and the American people. When you look at the numbers and see that America makes up 5 percent of the world yet houses 25 percent of the world’s incarcerated population, realize that this is NOT the “land of the free,” not by a long shot. This is for the very reason I just pointed out, namely, cops enforcing immoral, unjust laws. A “good cop” isn’t even comparable to Santa Claus or the tooth fairy; at least with those myths something good comes of it for the children. A cop is the opposite of these two myths. Instead of sneaking into your house to deliver toys for the children and leave undetected, they are more likely to show up in a no-knock raid, take what you have, and you better just hope they don’t shoot you. Or consider the tooth fairy. Instead of giving some money for a tooth that fell out, police are more likely to extract your teeth with their fist and then charge you with a crime. I know these words are harsh, but how am I supposed to defend bad behavior. If a person wants to do what’s right, then side with freedom, side with America and do what’s moral and righteous. Help America become what it was intended to be, a place where people live free of tyranny.